Traditional folk music and folk tales from the imaginary land of Pannonia. This is Pannonia’s second album, following "Another Time, Another Place", which was released in 2013. The first album was a collection of traditional folk tunes from the imaginary land of Pannonia. 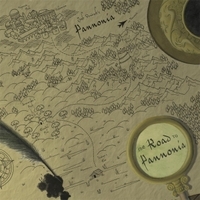 In The Road to Pannonia, we incorporate folk tales (by Peabody and Juno Award–winning author Chris Tarry) about some of the characters and places encountered on the quest to reach Pannonia. We hope you enjoy traveling with us!